Can I let you in on a little secret? Okay, here goes-my last pedicure was on September 18th! I guess with a hectic schedule as of late, my feet have gotten the major shaft. Poor little guys! But with the holidays quickly approaching, the time has come to remedy the situation. 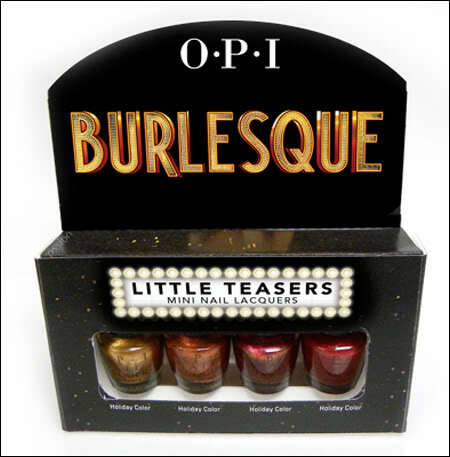 And what better way to ring in the Christmas season than with OPI's new Burlesque collection? I am in love with these smoldering new hues, inspired by the new film starring Cher and Christina Aguilera. Psst-I think this little set would also make a lovely stocking stuffer! First, I want those, bad. Second, I love your header picture like MONDO. Third? Why can't you let me bling your blog?!?! I'm just sayin!